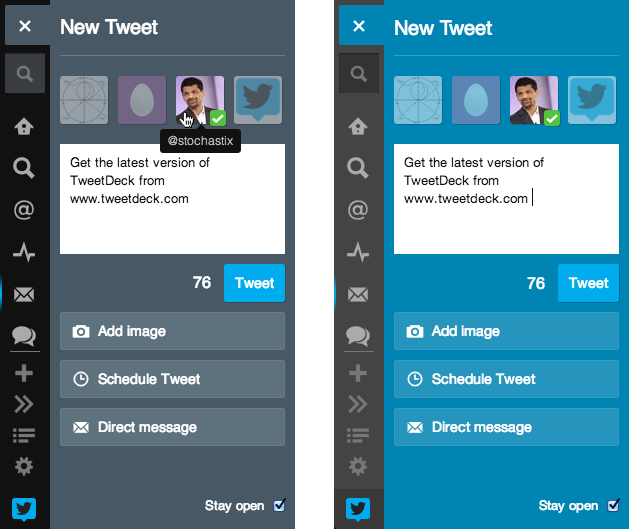 Twitter today announced a revamp of the new tweet panel in TweetDeck to make it easier to tweet, send DMs, and preview images to share. The company says the changes will be rolled out to all users gradually, beginning with the Web and Chrome versions of TweetDeck and followed “soon” by the Windows and Mac apps. First off, the New Tweet panel can be opened from the New Tweet button or by replying to a Tweet, is docked by default to the sidebar on the left, and includes an option to keep it open at all times. While the panel is open, you can still access the rest of TweetDeck by scrolling or using keyboard shortcuts. You can now choose the accounts from which you would like to tweet by simply clicking on the row of (larger) avatars at the top of the panel (selected accounts will show a green check mark and unselected accounts will be dimmed). There are three buttons below the New Tweet box: the Direct message button and Schedule Tweet button are rather self-explanatory and the Add image button lets you attach an image by uploading it to pic.twitter.com. 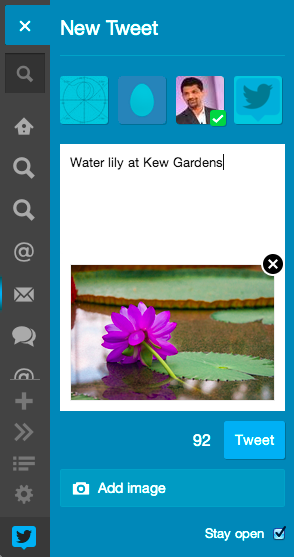 When you add an image to your tweet, the app will now show you a preview right in the new tweet panel. To remove the image from the Tweet just click on the “x” icon at the top right of the preview. 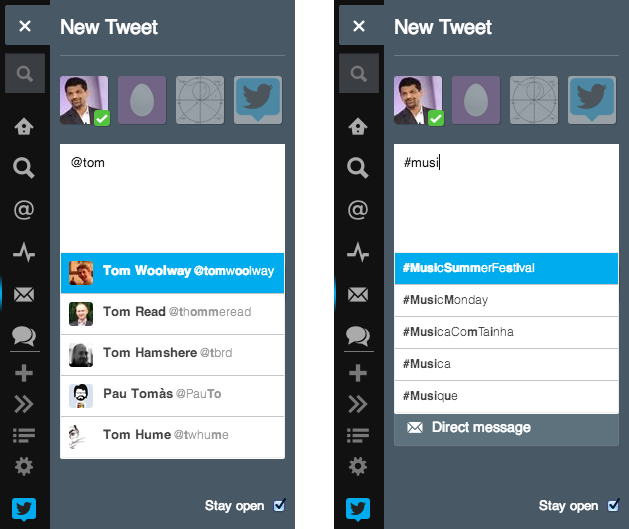 Until now, TweetDeck would only search for recently accessed usernames. Now the app searches across all Twitter usernames, although usernames of people you follow will appear immediately and at the top, as well as hashtags. Last but not least, TweetDeck now not only automatically shortens links in tweets to 22 characters as before, but it still shows you the original full URL. This extends to any t.co links: TweetDeck will display the full URL so that you can clearly see where the link leads to. While this update clearly focuses on the new tweet panel, it’s easy to see how it affects other parts of TweetDeck as well. Frankly, we can’t wait till it rolls out to all platforms.